Sidney left Brazoria, TX to join the Army/Air Force, 8th air Force, crew # 705th on Nov. 5, 1942. 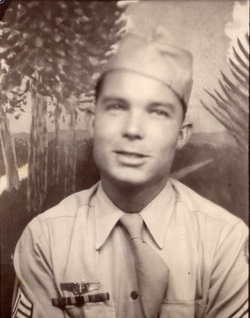 After finishing his training and learning Morris Code, he became a Radio Operator. After landing standing up in a freshly plowed field, some tall unknown man grabbed him, his chute and overshoes and told him to "come". He was then taken to a home and given civilian clothes but was told to keep keep his dog-tags on. Two days later Sidney met up with John Pidcock, their Engineer. They were then moved, in a straw covered wagon, to the home of Jon and Angel Boone in Obermeyer, Belgium for three months until August 5th, 1944 when they were liberated by the British. They then walked the 9 miles to Brussels, Belgium where they took a plane to London and secured a flight back to the United States to Santa Ana, CA. There Sidney met his wife Yolanda, was married by the Army Chaplin on June 30, 1945, was discharged on December 8, 1945. After procuring employment at Bethlehem Steel in Vernon, CA, Sidney and his wife heard of new houses being built in Lakewood, CA and with the help of his GI bill, they bought the house that Sidney still lives in today.